The low season for accommodation on the Gold Coast is arriving soon. Therefore today we would like to release a special promotion for our Student House Australia accommodation. 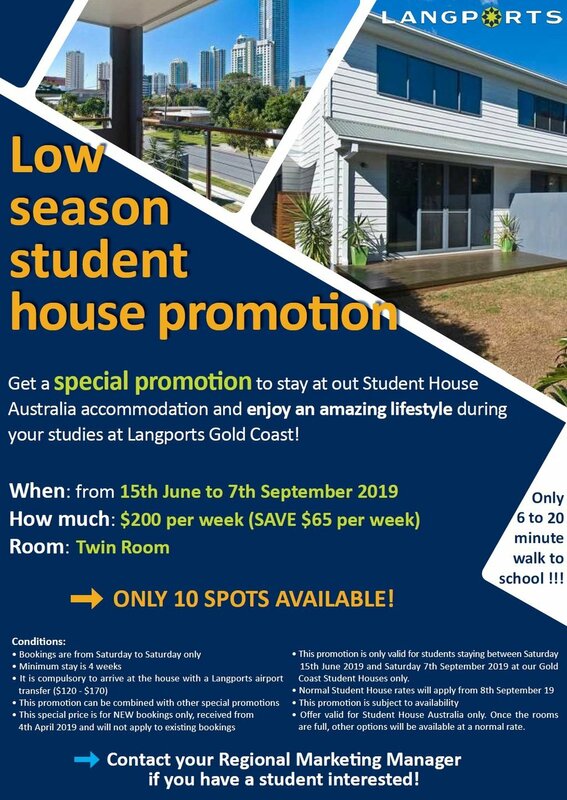 Get a special promotion to stay at our Student House Australia accommodation and enjoy an amazing lifestyle during your studies at Langports Gold Coast! Room: Twin Room – we only have 10 places available at that price! • Offer valid for Student House Australia only. Once the rooms are full, other options will be available at a normal rate. Please note that students can start their course before 15th June, but the promotional price for the Student House will only apply from Saturday 15th June. On the other hand, students can also finish their course after 7th September, but the promotion price for the Student House will only apply until 7th September 2019.